Plain and simple, water is filled with minerals and other impurities (e.g. chlorine, bacteria) that can harm your plumbing system, valves, and connected plumbing fixtures. Thus, the goal is to remove these harmful elements through water filtration and purification equipment which, in turn, protect and extend the lifespan of your plumbing components. 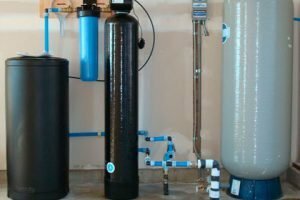 Reverse Osmosis - also known as “RO”, reverse osmosis-based systems make use of a semi-permeable filter or membrane which water passes through and removes 90% - 99% of tap water impurities. As a result, the water is rid of any minerals. Water softeners - a water softening device removes calcium, magnesium, and other impurities from hard water (i.e. water with high mineral content), which can damage a plumbing system and lead to mineral deposits. UV light purification - the most effective for disinfecting and removing bacteria from your water, UV light purification is low maintenance, requires little energy, and does not alter the taste or odor of your water.